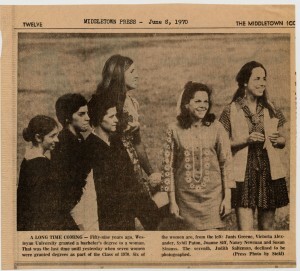 In this June 1970 Middletown Press photo, six of the seven women who received degrees at the 1970 commencement, are pictured. Yet this year, Wes celebrates 40 years of women at Wesleyan, from the early female varsity athletes (some of whom competed on men’s squads until enough women could be found to join) to the influx of women who integrated the largely male professoriat (and now make up about 46 percent of the faculty). 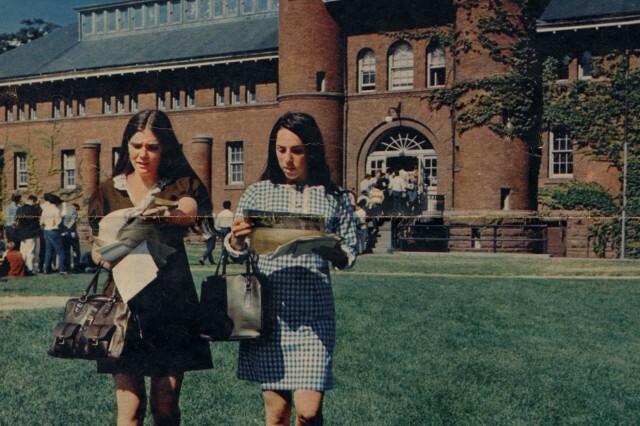 “It was conveyed to me when I was hired that Wesleyan didn’t want to just add female students; it wanted to change the university culture,” said Sheila Tobias, the first female provost at Wesleyan who was hired in 1970 and charged with not just overseeing the inclusion of women students, but to help hire and promote female faculty. A series of events around the anniversary are planned, kicking off Oct. 11 and 12 with daylong seminars open to the entire campus community. “Women in STEM Day” on Oct. 11 is an afternoon seminar of networking and information for women students considering careers in science, technology, engineering and math careers. The event, from noon to 6 p.m. includes lunch, and will feature panels with alumni and faculty and keynote speaker (and self-described geek ) Noirin Plunkett. For registration contact Karen Warren. Forty years of women of Wesleyan. The next day Tobias will help lead “Campus Transformation Through Coeducation,” a daylong event including a panel discussion with female change agents from the 1970s and discussions with alumni and faculty about campus culture of the late 1960s and early 1970s. The impressive lineup of speakers includes Adele Simmons, who helped integrate Tufts, was the first female officer of Princeton University and later president of Hampshire College; Lilli Hornig, who broke ground teaching chemistry at Brown after earning her Ph.D. in 1950 from Harvard, and later was an activist for university women’s issues; Nancy McIntire, the first female dean at Williams in 1970, and Elga Wasserman, who oversaw coeducation at Yale starting in 1969. Alumni can register for the event online here. Faculty, staff and students can register by e-mailing jhealey@wesleyan.edu.